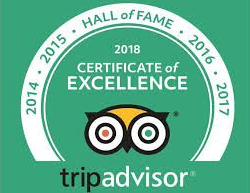 We’re delighted to announce that we have won the Trip Advisor Certificate of Excellence again this year, and as it is the fifth year running we’ve been inducted into the Hall of Fame. Thank you to all of our customers, friends, and staff for your continued support in our business. It’s much appreciated.